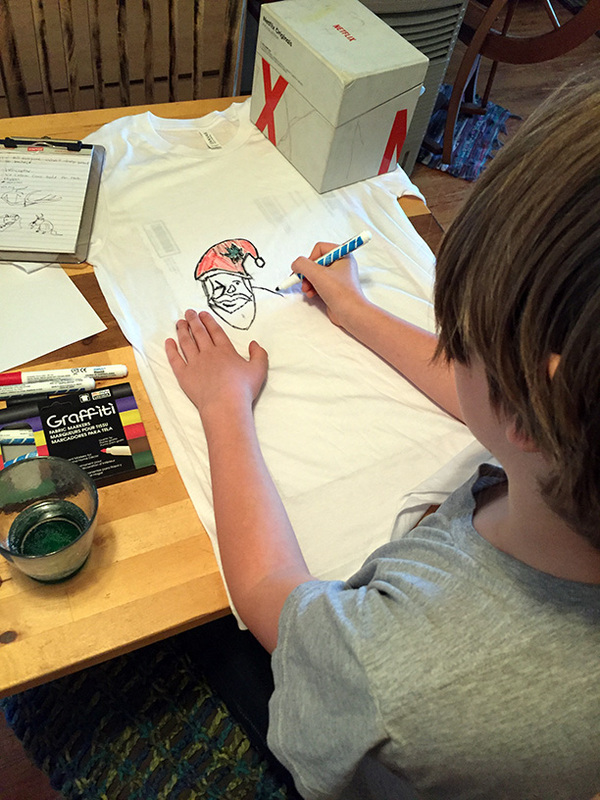 At our house, we’re well into holiday craft season. Every year we do something crazy and new like a snowman made out of old cans (it never melts!). 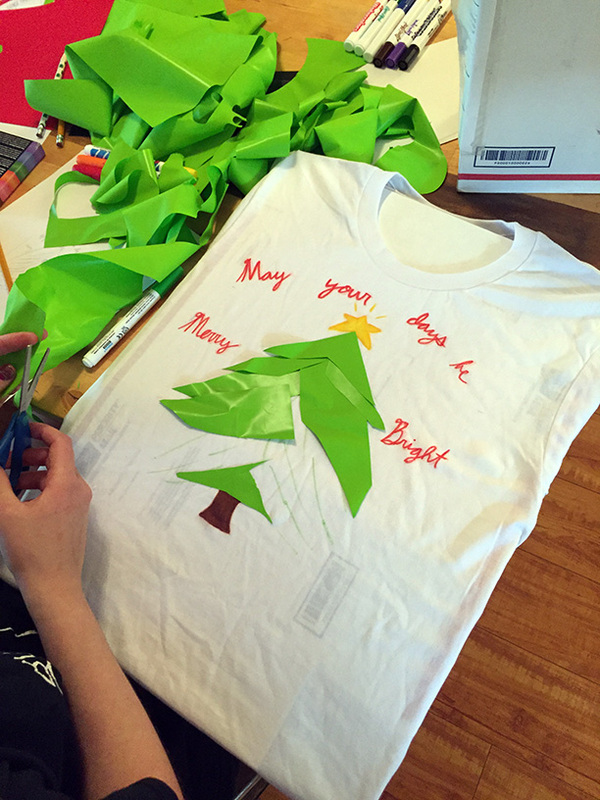 This year we dug around the print shop for ideas and rummaged out (surprise) handmade t-shirt decoration. 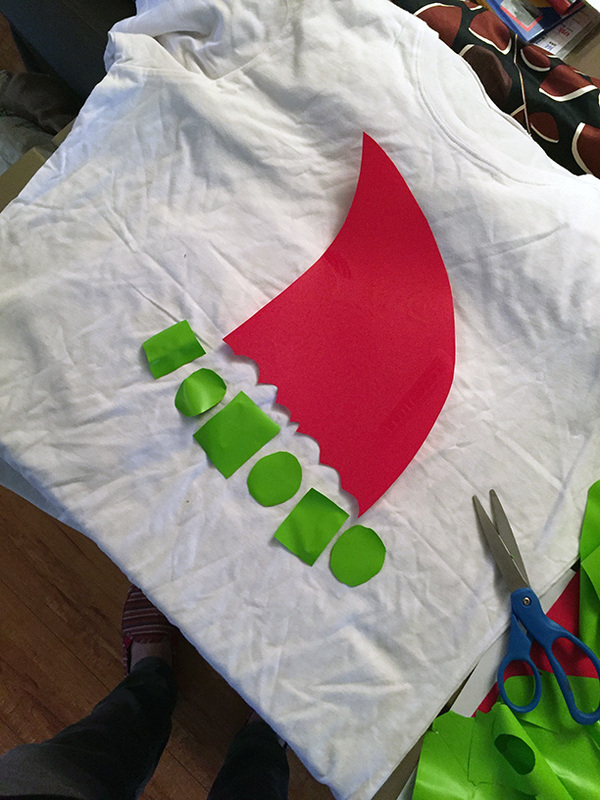 In addition to screen printing as a t-shirt decorating option, we also do some vinyl heat press work, typically for one-offs or very small orders. 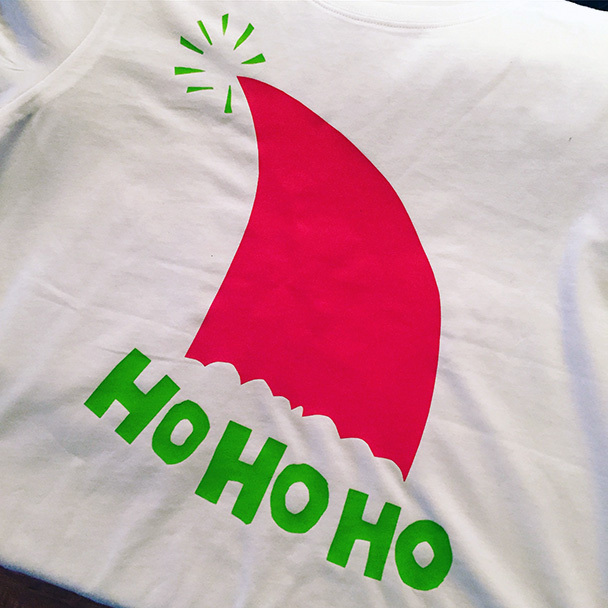 The vinyl is cut on a plotter from an Adobe Illustrator file, so it’s very exact. You just peel (weed) away the excess from the parts you want to keep and then press it on the shirt with gobs of heat and a ton of pressure. After a few orders, I noticed how much vinyl was left laying around, destined for the trash. Exhibit A, egregious vinyl waste. As I imagined this pile in the trash I thought, that just can’t happen. We save all our excess ink, so why are we throwing away all this excess vinyl? Crazy town. One person’s trash is another person’s treasure so they say. Whoever they are, they’re right. But what to do with the excess vinyl? Once it’s off the backing film, we can’t put it back through the plotter. Exactness is out the window. But to hell with exactness! What if we could make things without needing to be computer-precise for a change? I smell a craft coming on. 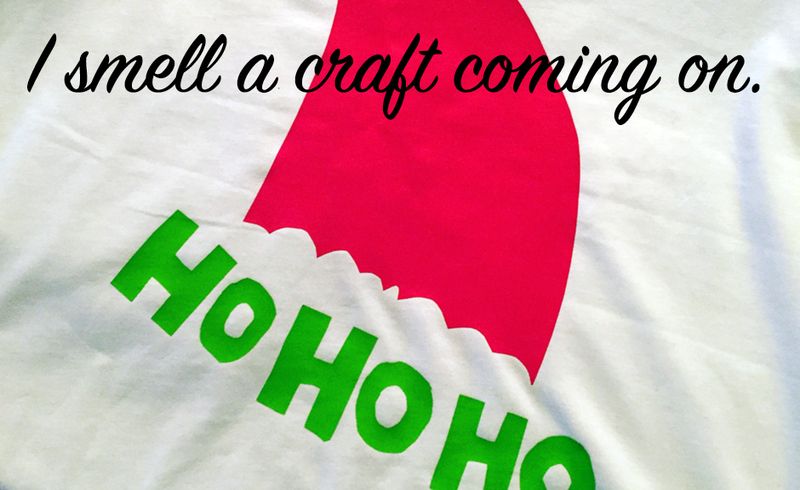 When decorating shirts for a customer order, I like things orderly and organized. 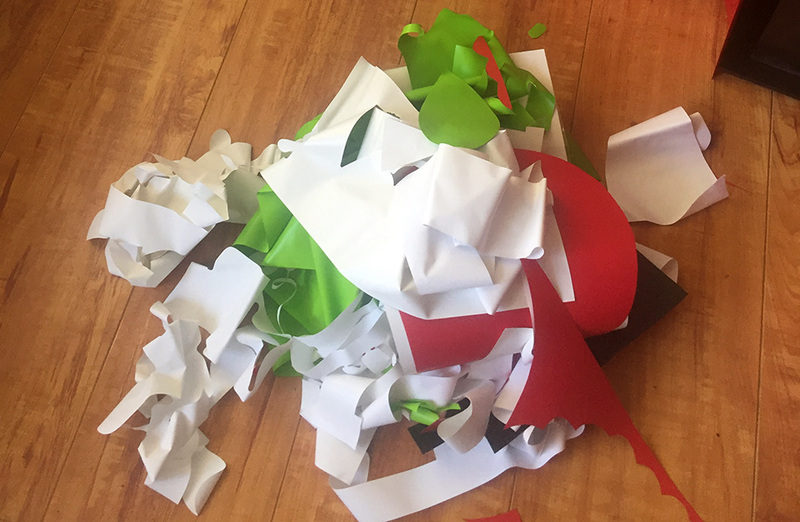 When doing a fly-by-the-seat-of-our-pants craft project, we all silently agreed upon the maxim, “When crafting, make as large a mess possible.” Goal achieved. The table was a mess of vinyl, markers, cardboard and beverages. The air was rife with the odor of creation (or maybe that was lemon ginger tea). 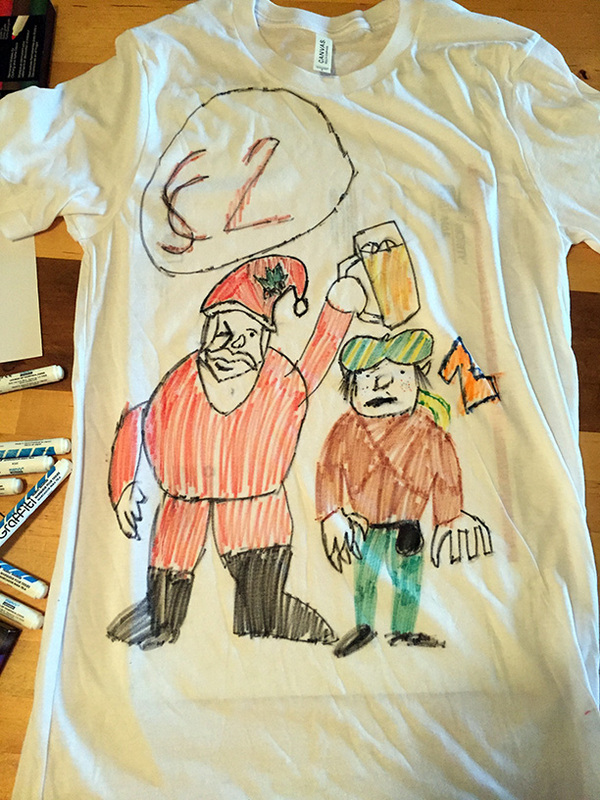 We all took very different approaches to masterminding our shirt designs. 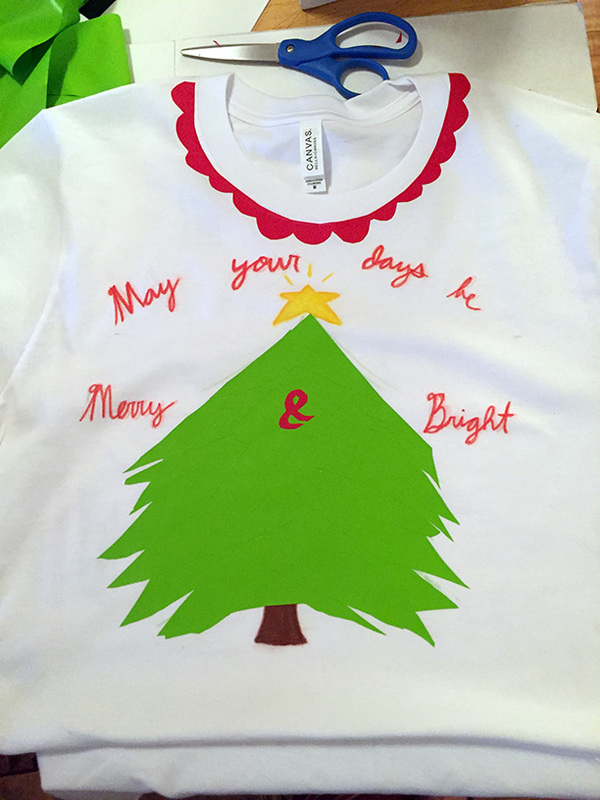 I went minimalist with 100% vinyl, Gwendolyn created a complex tree accompanied by cursive text and collar embellishment. 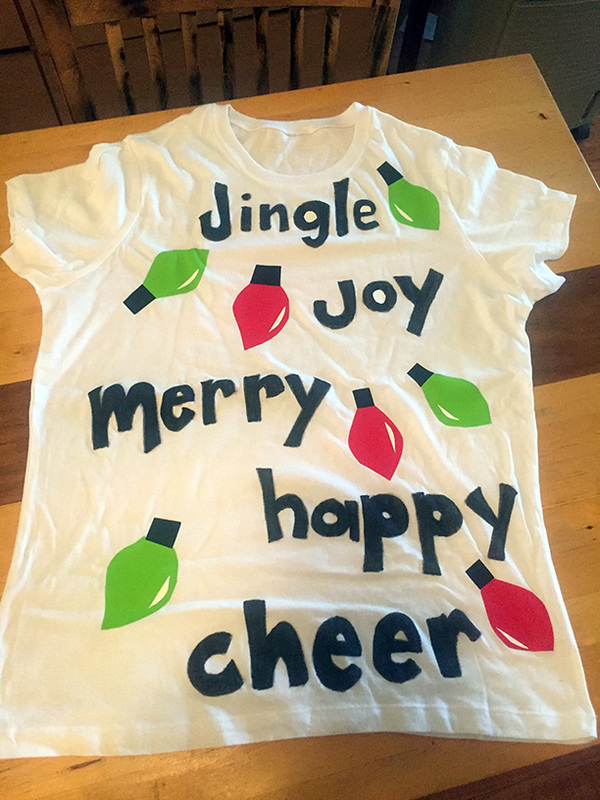 Jenni laid down her signature happy font with colorful vinyl bulbs and H went full-on marker, inspired by his favorite holiday movie, The Santa Clause 2. My minimalist shapes. Should I be trusted with scissors? After pressing. I can be trusted! After pressing. The ampersand was a stroke of genius. Get it? Stroke? H decorating without a net! That’s egg nog, guys. Watch the movie! It was fun decorating these, even if it was one big experiment. The best part was not being so exact for a change. I love the crafty handmade look. We also learned a lot about using the excess vinyl – yes, there’s a right side up thing you have to watch out for – that not only gives us more ideas, but helps us better understand our process for making vinyl shirts for customers. That sounds super geeky, but it’s true. 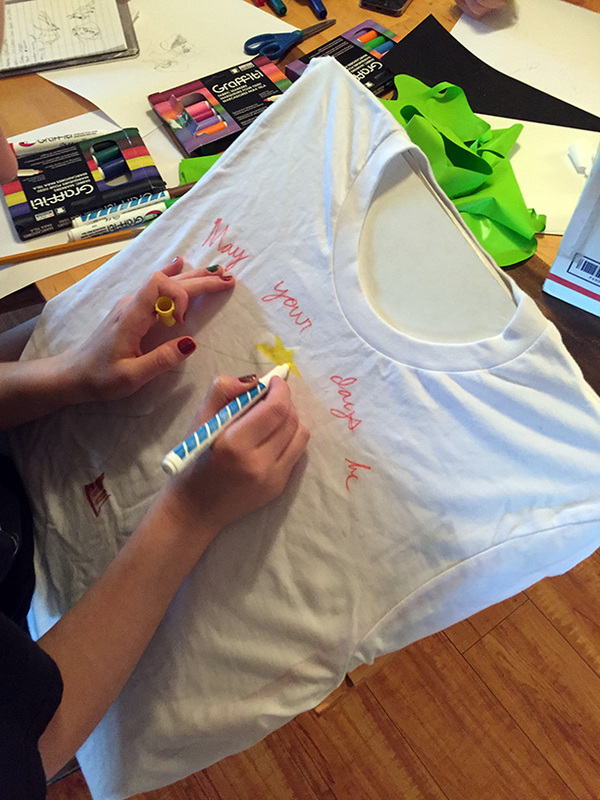 If you want to do this at home, you don’t have to have vinyl or t-shirts laying around like a pro apparel shop. Everything you need is at your local craft store. 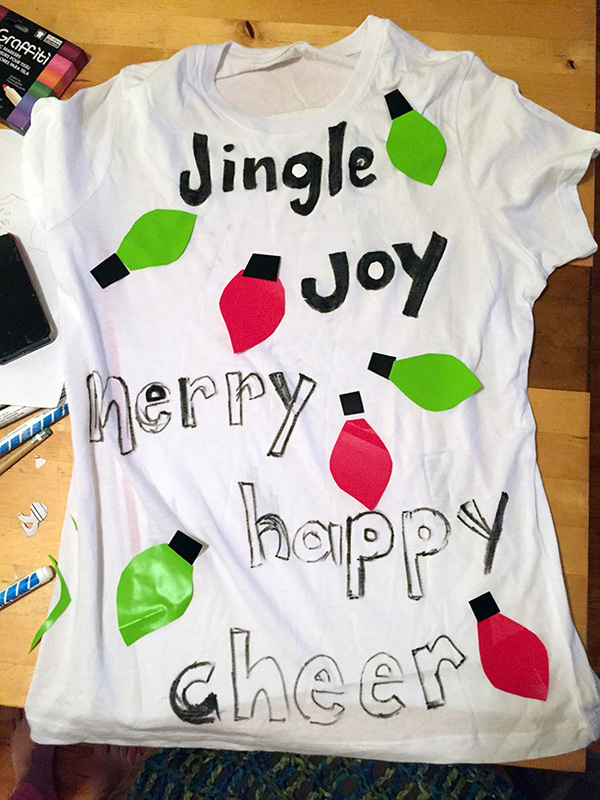 Try Joann’s for iron-on vinyl (you don’t need to buy the fancy cricut machine, just use scissors) and get some dollar store tees (or again, Joann’s, Michaels, Ben Franklin, etc). Go crazy. No, seriously. Don’t get hung up on perfection. Just have a good time. Send pics!